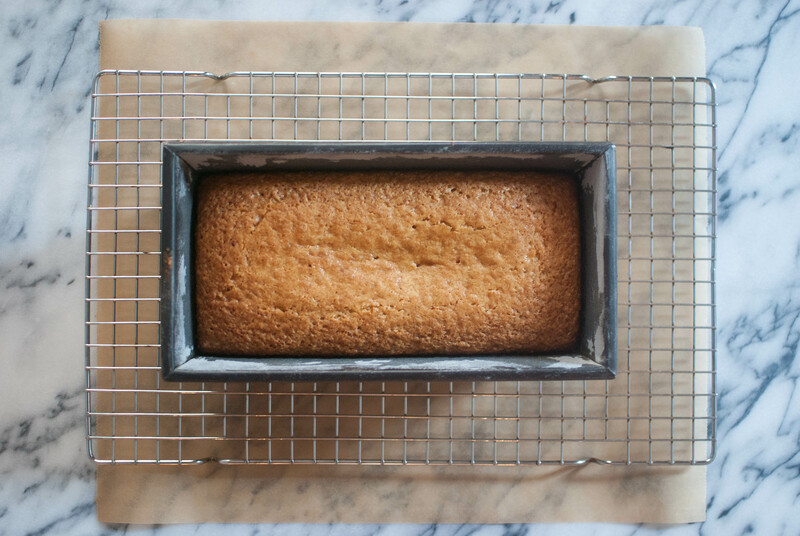 I’ve been wanting to make an olive oil pound cake for who knows how long. I don’t think I’d ever actually tasted an olive oil pound cake before, but it’s one of those things that just sounds good, isn’t it? This recipe is from The Smitten Kitchen Cookbook, which I got for my birthday a little while back (thanks, mom and dad!) 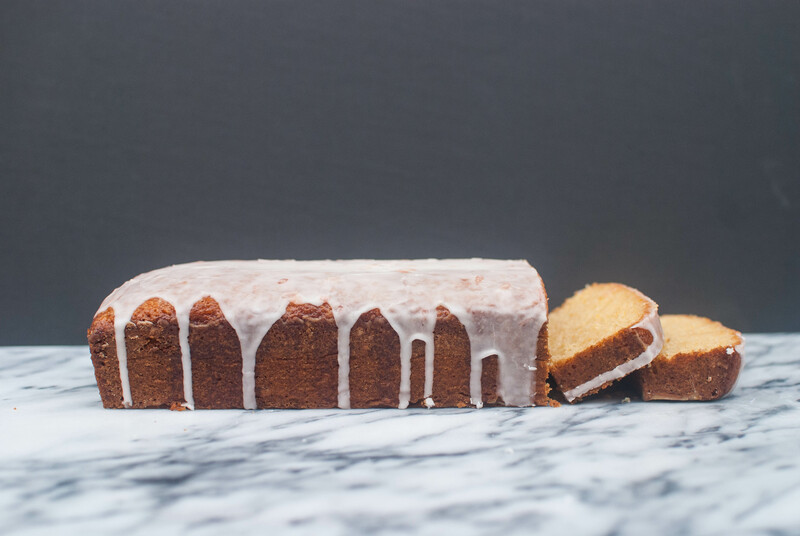 It’s kind of a riff off a classic lemon cake and glaze, but with grapefruit as it’s shining star and olive oil–which compliments the grapefruit wonderfully–in place of butter. Oh, and it’s brushed with a yummy grapefruit syrup that keeps it nice and moist. 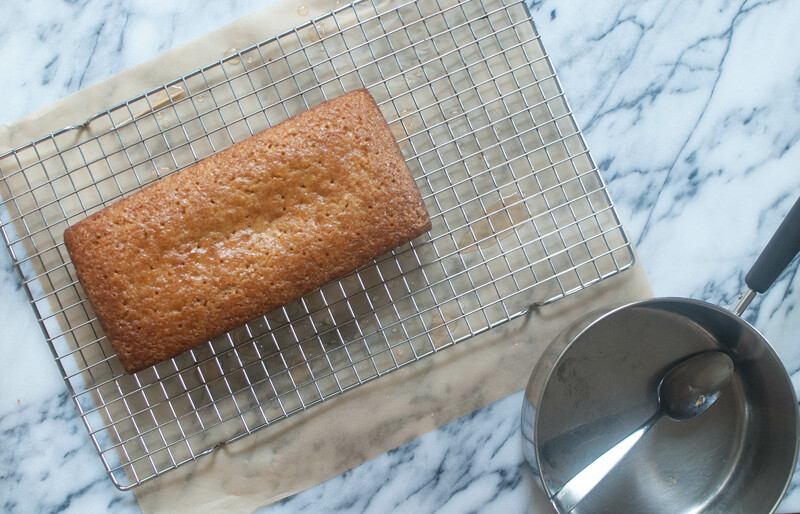 This cake is super quick to throw together and honestly, it’s probably not half as bad for you as your typical run-of-the-mill banana loaf (with heart-healthy olive oil and yogurt), making it absolutely perfect for breakfast as well as dessert (and everything in between, if you’re like me). 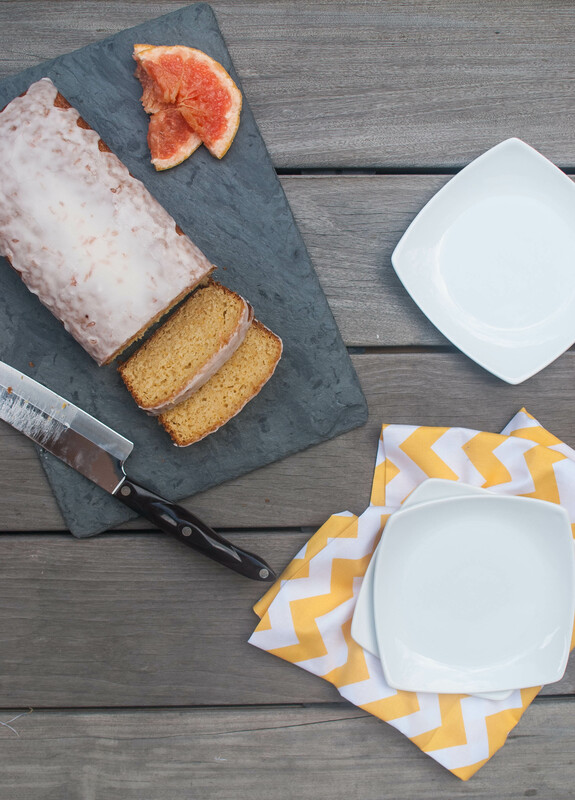 To make the cake, start by combining white sugar and turbinado (raw) sugar, then rubbing in some grapefruit zest with your fingers to help release the flavors. Whisk in a half cup of olive oil, then 2 eggs and set aside. In another bowl, combine some flour, baking powder, baking soda and salt. In a liquid measuring cup, whisk together a bit of whole milk yogurt (or buttermilk), some grapefruit juice and vanilla, then alternate adding the dry and wet ingredients to the sugar/oil mixture, starting and ending with flour. That’s it for the batter! Pour it into a 9″ by 5″ (give or take) loaf pan that’s been buttered and floured and throw it in a 350 F oven for 40-50 minutes, or until the cake is golden and a toothpick comes out clean when inserted in the middle. Yum! Let it cool on a wire rack for 10 minutes while you make the syrup. Just combine some grapefruit juice and sugar in a small saucepan and cook it over low heat until all the sugar is dissolved. Then, turn the cake out of it’s pan and set it right-side up on the cooling rack again. Use a toothpick to poke deep holes all over the surface of the cake and spoon or brush the syrup over the top. The cake drinks it right up! Cool completely and make the glaze by whisking together some grapefruit juice, confectioner’s sugar and salt. 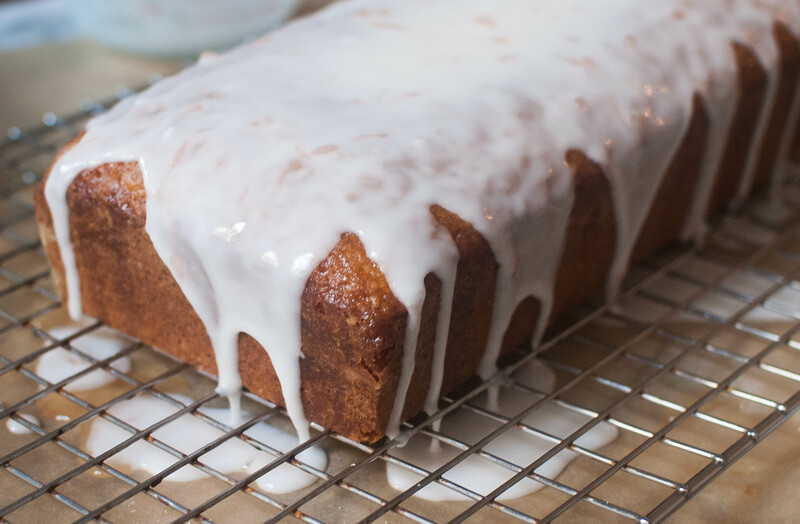 Once the cake has cooled, pour on that glaze! It helps to put parchment under your wire rack to catch the drips. Time to eat! This loaf won’t last 2 seconds at a party, trust me. 1. Preheat the oven to 350 F. Butter and flour a 9″ by 5″ loaf pan. 2. Start with the cake: Combine white sugar and raw sugar in a large bowl, then rub in the grapefruit zest with your fingers to help release the flavors. Whisk in the olive oil, then the eggs one at a time. Set aside. 3. In another bowl, combine flour, baking powder, baking soda and salt. In a liquid measuring cup, whisk together whole milk yogurt or buttermilk, grapefruit juice and vanilla. Using a wooden spoon, alternate adding the flour mixture and the yogurt or milk mixture to the sugar/oil mixture, starting and ending with flour, making sure not to over mix. Pour the batter into the prepared pan and bake for 40-50 minutes, or until the cake is golden and a toothpick comes out clean when inserted in the middle. 4. Cool the cake in the pan on a wire rack for 10 minutes while you make the syrup: In a small saucepan, combine grapefruit juice and sugar and cook over low heat until the sugar has dissolved. Turn the cake out of it’s pan and set it right-side up on the cooling rack again.Use a toothpick to poke deep holes all over the surface of the cake and spoon or brush the glaze over the top. Allow the cake to cool completely. 5. For the glaze, whisk together the grapefruit juice, confectioner’s sugar and salt. It should be thick but pourable. Pour the glaze on top of the cooled cake and allow it to set before digging in!